BlytheLife.com » Specs or No Specs? I wear glasses and I have since the age of 8 or 9. My dolls, while they don’t get eye tests, get glasses. I think Blythes look cute with glasses – clear or tinted. Like with people, I think that glasses add to the personality to Blythe like they do with people. 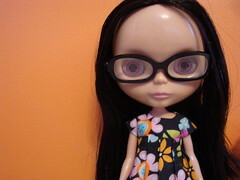 While not all of my dolls wear glasses all the time, I do have one that frequently has glasses on. Glasses aren’t for everyone though, and if you have a custom doll you may be unwilling to put glasses against your doll’s face due to the fact that it could scratch the face-up and I don’t blame you. I don’t put glasses (sunglasses or otherwise) on my custom girl because I get worried about scratching her face. I’m less worried about stock dolls because there’s no sealant or customized make-up. 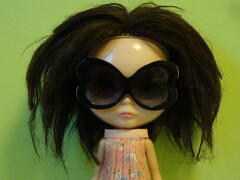 Do your dolls wear glasses or do you refrain from putting glasses onto your dolls for whatever reason? My girls have worn glasses for photos, but not on the shelf. We don’t actually have many! Only one of my girls wears glasses and they look nice on her, they add that final touch to her intellectual appearance. Vea and Janie wear glasses. They have bad eyesight. They wear them all the time. But you are right….ZuZu put on Vea’s glasses for a picture during the first week of her 365 and got HUGE black scratches! I almost lost it – all I could think of was how am I going to work with this for the rest of the year!?! We are managing but ZuZu gets a new face up soon! And we are careful when we put Vea and Janie in their travel bags – taking their glasses off first. I think it is really cool for dolls to wear glasses. It sets them apart because it looks actually adorable. Plus, not all dolls wear specs so that makes them unique.